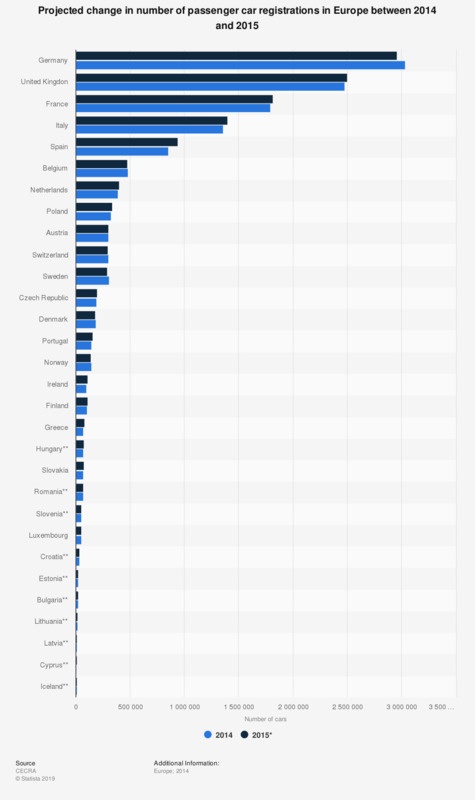 This statistic shows car registrations for 2014 and forecast passenger car registrations for 2015 in Europe. It was estimated that a total of 13,137,600 passenger cars will be registered in Europe in 2015. This represents an overall increase of 1% on 2014 when 13,009,252 cars were registered. Seven of the 30 countries have a projected decrease in car registrations. Includes EU 28, Iceland, Norway and Switzerland. Data for Malta not available.